A recent comment on Trip Advisor made all sorts of happy comments and one great suggestion, "...maybe little lotions with the other goodies in the room for those guests with sunburnt skin :o)." Her comment sent me into a flashback to my own honeymoon when Innkeeper Dave had to spend three nights in a tub of cold water because he insisted that he "never" got a sunburn at the beach. Trust me, freshly cooked lobster doesn't put off as much heat or as much red color as he did. Lo and behold: our in room amenity basket now includes a skin soother. As you can see from the photo, it seems to be a hit with the guests. So, Peanuts 0612, thank you for your comments and suggestions. And I'm sure the guests that are using the spray would thank you too. If anyone else would like to post a review, Trip Advisor and Bedandbreakfast.com are two popular sites. As always we would love to hear from you directly about ways to improve your stay. 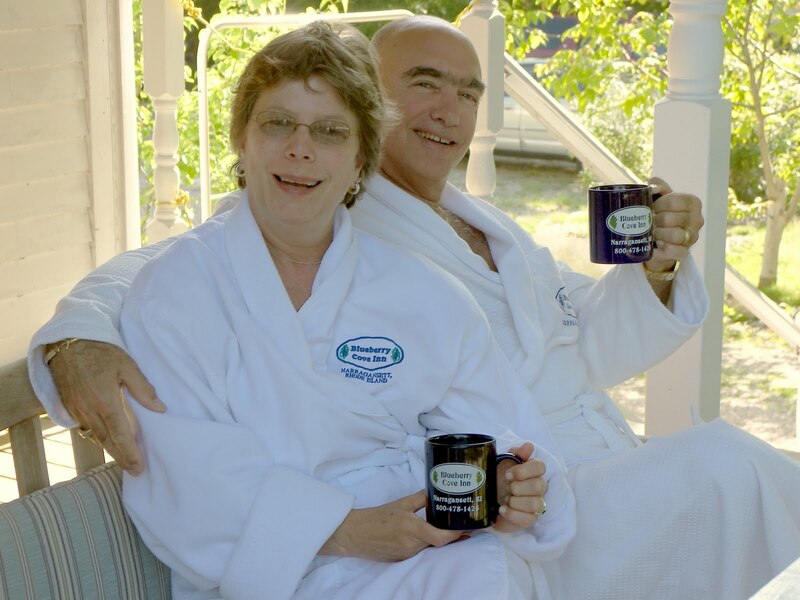 What better place to relax on a sunny morning than the porch at Blueberry Cove Inn, Narragansett, RI? Fresh coffee, a pleasant breeze, your special someone and a glider are a great way to start the day. After breakfast on the other morning, Seely went out to feed the birds, only to discover that one of our most cherished adornments had met a ghastly fate. Alfie the Otter has been a part of our daily lives for more than 12 years at two different residences, in Texas and Rhode Island. 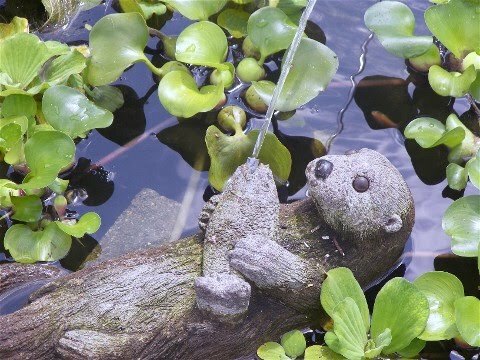 The fired-clay, lifelike sea creature hung out in our garden in Houston and for the past three years has served his natural function as a water circulator in our goldfish pond. It was somehow quite soothing to see Alfie lying on his back in the pond with the curling stream of water shooting out of the mouth of the little fish he clutched to his chest. Our feathered visitors loved to perch on him while waiting their turn at the feeders. But on Saturday morning, we noticed that Alfie had been beheaded, his whiskered face submerged in the water several feet from his torso. Our first thought was terrorists, but after a closer examination, foul play seemed unlikely. We concluded that after spending the last few winters trapped in ice, Alfie probably developed some cracks along the neckline. We're guessing that one of the larger visitors to our network of feeders (I'm choosing to blame the grackles) landed on Alfie's head with just the right ratio of weight/descent velocity and became the bird that broke the otters neck. But even in distress, Alfie is still doing his job. His headless body continues to pump the water and the birds don't seem to mind his missing noggin. Maybe we should change his name to Ichabod. Bikes, Kites & Skis is pedaling into Narragansett with a location at 9 Pier Market Place. Bikes, Kites & Skis offers 21-speed adult and kid bikes, hybrids, beach cruisers for rent from a few hours to a full week, with prices starting at $15. Rentals include a helmet, lock and route map. A full range of kites from beginner to advanced are available to purchase or rent for $5 or $10, with the rental fee deducted from the price of the kite. For more information call 401-619-4110 or visit www.bikes-kites.com. This is great news for all of our guests that want to get out pedaling but don't want to drag a bike on their vacation. It also gives you new options when your companion tells you to, "go fly a kite." So be friendly, go meet the new neighbors and tell them we said, "Hi, welcome to the Pier." You didn't know that Weekends could have hang-overs? Oh, for sure, yeah. They get themselves all dolled up on a holiday and hang on the beach having fun with everyone that had three days off and suddenly they think the next weekend doesn't even exist! No consideration at all for a hardworking inn or B&B eagerly waiting for guests. To try to blast the Weekend back to work we have a special offer for June 3, 4, 5, and 6, 2010. Stay one night and get the second night half price. You don't even have to stay the second night. Spend the day having fun, come back to shower and nap before heading home in the evening so you are fresh for work Monday morning. Just reserve your room on-line and put the word "hang-over" in the special request box to get the discount. Simple, easy, fast. Let's teach the Weekend respect for all of us that didn't get Memorial Day off.